The woman said she was concerned about how the place was being run. 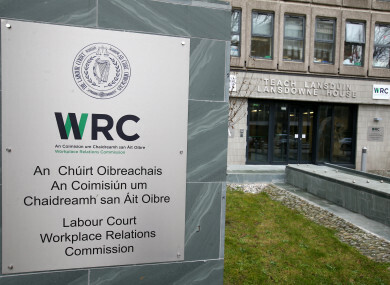 A WOMAN HAS been awarded €17,500 after a ruling that she was unfairly dismissed from her job at the Southside Travellers Action Group in Dublin. The woman alleged that she was let go from her position as a senior youth worker as a result of her raising a number of issues about how the service was being managed. In a ruling, the WRC found that while she was not let go because of the protected disclosure, she was unfairly dismissed due to the way the charity went about removing her from the position. Siptu’s Vivian Cullen, who represented the woman at the Labour Court, said that throughout her employment, the woman had raised issues and legitimate concerns surrounding the operation of the services. These related to the level of her salary, the dispersal of funds throughout the organisation and the non-Garda vetting of some employees. The woman started her employment as a part-time youth worker in July 2013. She was appointed acting Senior Youth Worker in April 2014. A year later, she was offered a contract as programme manager of the Children & Young Persons Programme on a fixed-term contract ending on 31 December 2015. Her employment was terminated on 31 March 2016. Cullen submitted that the woman’s employment was terminated in uncommon circumstances. She was told she would be let go if she did not work inside the terms of her job description, fully communicate with all staff and sign her contract of employment on 31 March 2016. Cullen said that the employer took pre-emptive action and sent out a letter to her by courier at midday on 31 March 2016 terminating her employment. She was on leave on that day and Cullen said that she was unaware that the company had imposed a strict stipulation, that the contact be signed by 12 noon on that day. Cullen claimed that, because of the woman’s complaints regarding the service, she became a target, marginalised and subjected to unfair treatment, and that her work situation became increasingly difficult. The Court considered all of the evidence and was not convinced that the termination of her employment arose as a result of her having made protected disclosures. However, it did rule that she was unfairly dismissed on 31 March 2016 and ordered that she receive €17,500 in compensation. Email “Traveller charity ordered to pay €17,500 for unfairly dismissing woman who raised concerns over garda vetting”. Feedback on “Traveller charity ordered to pay €17,500 for unfairly dismissing woman who raised concerns over garda vetting”.